Prof. Pietro Ducange gives a talk about “ Social Sensing and Sentiment Analysis – How to exploit On Line Social Network as information sources“, in Sheffield Hallam University. 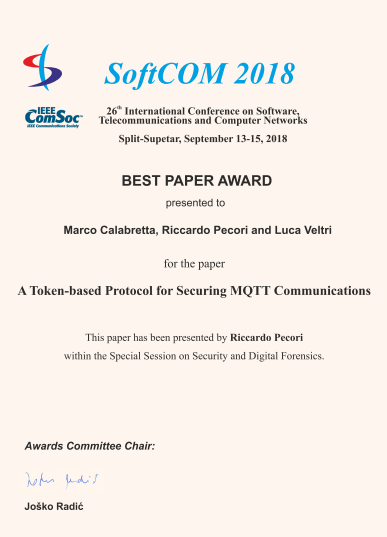 Dr. Riccardo Pecori attends SoftCOM 2018, XXVI International Conference on Software, Telecommunications and Computer Networks, in Split-Supetar, Croatia, as presenter of the paper entitled “A Token-based Protocol for Securing MQTT Communications” he coauthored. 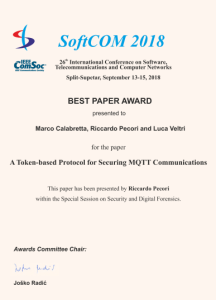 The paper has also been awarded as “Best Paper”. Dr. Riccardo Pecori attends WIVACE 2018, XXIII Workshop on Artificial Life and Evolutionary Computation, in Parma, Italy, as Program Committee Chair and coauthor of the paper entitled “An Improved Relevance Index Method to Search Important Structures in Complex Systems “. Dr. Riccardo Pecori attends Evostar 2018, XXI European conference on evolutionary computation, in Parma, both as member of the local organizing committee, and as coauthor of two papers accepted at EvoApplications. They are entitled “Social Relevance Index for Studying Communities in a Facebook Group of Patients” and “Can the Relevance Index be Used to Evolve Relevant Feature Sets?” respectively. Prof. Pietro Ducange participates to the Third IEEE International Conference on Research in Computational Intelligence and Communication Networks, in Kolkata, West Bengal, India, where he will give a keynote speech about social sensing and sentiment analysis. Prof. Pietro Ducange particpates at the International Conference on Smart Systems and Technologies, in Osijek, Croatia, where he will give a keynote speech entitled “Social Sensing and Sentiment Analysis”. Dr. Riccardo Pecori participates to the 14th International Symposium on Wireless Communication Systems, in Bologna, Italy chairing, as leading organizer, the special session on “Communication, Security and Data Analysis in the Social Internet of Things” and giving a keynote speech entitled “Internet of Things Toward Social IoT”. Prof. Ducange participates with 2 papers to the IEEE International Conference in Fuzzy Systems, in Naples, Italy: “Multi-Objective Evolutionary Granular Rule-based Classifiers: An Experimental Comparison” e “A Novel Approach for Internet Traffic Classification based on Multi-Objective Evolutionary Fuzzy Classifiers”. 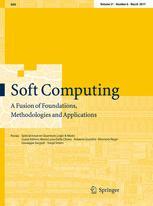 has been accepted for pubblication in the proceedings of FuzzIEEE 2017, Naples, Italy, July 2017.
has been accepted for pubblication in Springer journal entitled “Soft Computing”. has been accepted for pubblication in the proceedings of IoTBDS 2017, Oporto, Portugal, April 2017.
has been accepted for pubblication in the proceedings of ICEUTE 2016, San Sebastian, Spain, October 2016.